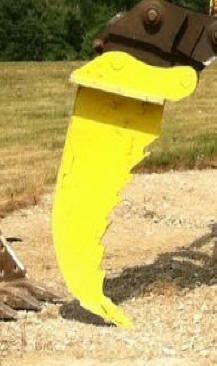 One look at the aggressive design of this Stump Remover / Root Saw / Frost Hook attachment says it all. The focused and pulling force behind this attachment is unbelievable. 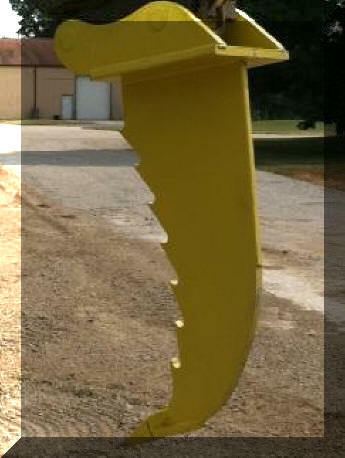 The attachment gives you the ability to saw thru roots, remove stumps, section extremely large stumps into manageable sections and rip thru frozen ground. The ripper is so user friendly that you have the ability to even remove the soil from the stumps prior to transport or burning. 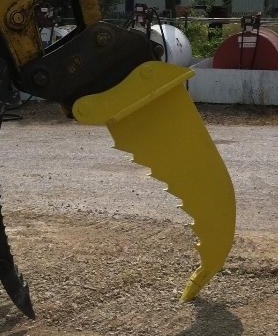 Use of the ripper saves your existing buckets and pins from twisting and breaking, while giving your machine 10X the pulling and ripping force it had while equipped with your conventional bucket. Additional benefits of our aggressive design include fuel savings, lessen the wear and tear to your machine and increased job production. The ripper comes in 3 sizes 24" 30" and 48". Let us build one for you today!! We have 3 simple ways to get started (1) go to our web site excavatingsolutions.com and fill out the easy to follow pin form. (2) send us an e-mail or (3) give us a call. We will provide you with a timely estimate and impressive turn around time to keep your equipment out in the field operating efficiently. Please view the video below to explore the revolutionary products and designs we are providing to the excavating world.